Does your boat have a tower? If so, these tops will not fit. Click here to find a bimini top for boats with a tower. First, consider what portion of the boat you want to cover and the type of the boat that you have. Lengths offered include 5', 5'6" (for 2 bow tops), 6', and 8'. How should you choose the size that you need? The 6' top is the most common and popular length for boats. It looks great on runabouts, center console boats, and most other types of boats. 8' tops are very large tops that are mainly used on pontoon boats. 5'6" 2 bow tops are used only on small fishing boats. 5' tops are used for ski boats, like Malibu or CorrectCraft. Next, consider where you want the top mounted. Our tops will allow mounting on virtually any surface, like on the wing of the windshield or even on a rail. All mounting hardware is included! To get your mounting width, find the mounting point on one side of the boat. Measure the width between that point and the corresponding point on the opposite side. Note: This is almost always different from the width of your boat. 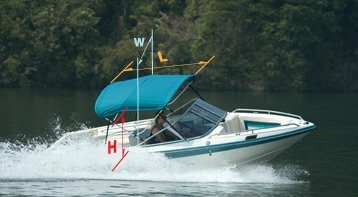 Stand inside your boat and measure from the mounting point up to get the height of your top. This height can be added to the depth of your boat to determine the amount of clearance you will enjoy. How should you decide on the height that you need? Remember that, the taller you go, the less shade you will have. Most runabout boats are very well served with 36" or 46" tops. Center console boats typically require a 54" top. Pontoon boats typically require a 48" top. These are only recommendations based on the feedback of satisfied customers. You will want to consider the height that is best for you and your needs. Note: The height of your Bimini top is determined from the mounting point up, not from the floor of the boat. Trying to Fit a Bimini Top Underneath your Wakeboard or Ski Tower? Click a swatch for more details about a bimini top material and its available colors. Square tube pontoon frames and stainless steel frames may vary.